Our readers nominated their favorite subscription boxes, then voted on the boxes they loved most. Here’s what they chose as the Best Women’s Fashion Subscriptions! These are the best women’s fashion subscription boxes as voted on by YOU in our 2019 Subscription Box Awards. This list spotlights women’s clothing, but includes a few boxes with accessories and more, so you can keep your look on-point and on-trend. Cost: $20 styling fee (applies to any items you decide to keep.) Subscribe here! Why You’ll Love It: The best part of this styling service is that it’s customized just for you. When you sign up for StitchFix, you’ll take an in-depth survey of your sizes, your style, and your pricing preferences. After choosing when you’d like to receive your delivery, your stylist will hand-pick 5 clothing and accessory items just for you. Keep what you love, return what you don’t. Check out all of our Stitch Fix reviews and our Stitch Fix details to learn more! Ships to US only. Cost: $99.99 per quarter. Subscribe here! Why You’ll Love It: Every season, Rachel Zoe and her team hand-curate more than $400 worth of their favorite fashion, beauty and lifestyle items to share with you in Box of Style. You can expect gorgeous jewelry and accessories, cosmetics, beauty products, and other luxurious items that will add instant glamour to your lifestyle! Check out all of our Rachel Zoe Box of Style reviews and our Rachel Zoe Box of Style details to learn more. Ships free to the US, and $15 Canada, Australia, and the UK. Cost: $49.95 a month. Subscribe here! Coupon: New VIP members can get 2 pairs of Fabletics leggings for $24. Why You’ll Love It: Fabletics curates high-quality, on-trend athletic clothing to fit your size, style, and needs, with new options available each month. You’ll love the flexibility to skip any month, or add additional items. Think stylish and sporty leggings, tops, shorts, and outerwear for yoga, running, and all kinds of other workouts. You’ll see chic and casual athleisure gear, too. Check out our Fabletics Reviews and our Fabletics details to learn more. Ships to the US, Australia, and Canada. Why You’ll Love It: JustFab is a monthly clothing, shoes, and accessories subscription serving sizes XS to 24W. You shop their merchandise like normal retail, but with the VIP subscription, you get better prices. On the first of each month, they release new styles—pick any items you like from your personal ‘Boutique’ or from across the site. Or, skip by the 5th of each month and you won’t be charged a thing. Check out our JustFab Reviews and JustFab details to learn more. Ships to US and Canada. Cost: $25 styling fee (applies towards items you choose to keep.) Subscribe here! “Love having a stylist that I can actually engage with on ideas.” – Jessica M.
Why You’ll Love It: Trunk Club is Nordstrom’s personal styling service for sizes XS to 3X. Start with a style survey or chat online with a stylist to start curating a perfect assortment of pieces to try. Preview what your stylist has picked for you before it ships and make adjustments to your liking. Then simply try on your looks, keep what you love, and return what you don’t! Trunk Club price matches exclusively to Nordstrom within 14 days of purchase. Also, the $25 styling fee is waived if you use a Nordstrom credit or debit card! Check out all of our Trunk Club reviews and Trunk Club details to learn more! Ships free to continental US, with an additional charge to AK and HI. Coupon: Get your first set for only $24.95! Why You’ll Love It: Adore Me is a monthly intimates subscription that lets you shop high-quality lingerie, sleepwear, athletic sets, and swimwear for a great price. Log into your account between the 1st and 5th of each month to either shop for the set you’d like or skip that month. Adore Me offers items picked specifically for you, but you can always browse the entire site if you prefer. Your monthly fee gets banked as a store credit if you skip. Every 6th set is free, and so are exchanges! Check out our Adore Me Reviews and our Adore Me details to learn more. Ships free to US, and $5.95 to Canada. Cost: $20 styling fee (applies toward any items you decide to keep.) Subscribe here! Why You’ll Love It: Dia & Co is a plus-size personal styling subscription with a knack for finding fun, trend-savvy looks for your wardrobe. You customize your preferences with your specifications, price range, and style likes and dislikes. Then, each month, you’ll receive 5 new pieces to try, handpicked by your stylist. Keep what you like, and get an extra 25% off if you choose to go with all 5 items. Check out our Dia & Co reviews and our Dia & Co details to learn more. Ships free to US. Cost: $25 styling fee (applies toward any items you decide to keep.) Subscribe here! Why You’ll Love It: Frank And Oak Style Plan is perfect for fans of a more minimalist, modern aesthetic. Choose to receive boxes every month or every other month—you’ll get to preview and edit your order as you see fit, then sit back and wait for up to 3 awesome wardrobe essentials to come your way. Returns are free, and you can feel good that you’re supporting a brand that strives for ethical, eco-friendly manufacturing practices! Check out our Frank And Oak Style Plan reviews and our Frank And Oak Style Plan details to learn more. Ships free to the US and Canada. Cost: Subscriptions start at $79 per month. Subscribe here! Why You’ll Love It: Le Tote offers designer-quality, stylish clothing and accessories for rental. Each month, you’ll get 3 garments and 2 accessories to flaunt from their extensive collection. Wear them together, or work them into your own wardrobe. You’re able to return and swap out items as many times as you’d like—it’s all covered by the monthly fee. You can also choose to keep items that you really love for a discounted price! Check out all of our Le Tote reviews and our Le Tote details to learn more. Ships to the continental US. Cost: Subscriptions start at $49 per month. Subscribe here! Coupon: Get your first month for free! “Great value!” – Liz B. Why You’ll Love It: Refresh your wardrobe with this super popular clothing rental service! Each month, you can rent up to 10 items, including cute dresses, separates, workwear, sweaters, jackets, and much more. Best of all, Gwynnie Bee just expanded their size range—they now include options for everyone from 0 to 32! Check out all of our Gwynnie Bee reviews and Gwynnie Bee details to learn more. Ships to US. Cost: Starts at $59 per month. Subscribe here! “Their clothes are adorable and I love getting surprise items!” – Alex C.
“I like that you can pick some of the items in your tote.” – Kristin D.
Why You’ll Love It: Golden Tote releases a new collection each month, and for most plans you’ll get to pre-select at least one item in your tote. The others are a surprise! You’ll get to keep whatever you receive, including a cute new tote with each delivery. Your style profile also lets personal stylists curate for you, up to 2 to 5 items depending on your plan. If you love surprises, this is the subscription for you! Cost: $50 per month. Subscribe here! Coupon: Use code MSAROCKS for 20% off your first box! Why You’ll Love It: The Luxe Catch subscription curates around a monthly theme to bring you designer fashion at a bargain price. Each month, you’ll receive 1 to 3 expertly-curated items that have a total value of up to $200. It’s a great deal, and you’ll love the specialized attention to your style, taste, and preferred brands. You’ll start by creating an intensive style profile. It’s a great way to experience brand-name garments, accessories, and jewelry. Check out our Luxe Catch reviews and Luxe Catch details to learn more. Ships free to US, and internationally with additional costs. Cost: $20 styling fee (applies to any items you keep.) Subscribe here! Why You’ll Love It: Each Wantable Style Edit includes 7 clothing and accessories items curated for you by your stylist using your style profile. Items are on trend, name brand, and tailored to your size and taste. You have 5 days to try everything on, and then send what you don’t want to back in the easy, prepaid envelope. Pay for and keep only what you love! Check out all of our Wantable Style Edit reviews and Wantable Style Edit details to learn more. Ships to US. Cost: $9.78 shipping fee per month (applies to items you decide to keep.) Subscribe here! 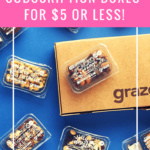 COUPON: Use code NADINE to waive shipping fees on your first box! “Affordable & cute!” – Rachel J. “Love Nadine West! They really nailed my style and price range. Looking forward to my next box.” – Carol D.
Why You’ll Love It: Each Nadine West delivery includes 2 to 4 clothing and accessory items curated to match your sizing preferences. They learn your taste based on what you keep. You usually get a cute top and unique jewelry that can work together or go with other looks. Choose what you’d like to keep and return the rest! Check out all of our Nadine West reviews and our Nadine West details to learn more. Ships to US. Cost: $21 per month (applies toward items you decide to keep.) Subscribe here! Why You’ll Love It: Each month, Rocksbox will recommend jewelry pieces that suit your style. You can also browse their catalog and add pieces to your wish list. They’ll curate sets of three to send your way, including at least one piece from your wish list. Try the pieces on, wear them as much as you’d like, and swap them out for a new set when you’re ready! Love a piece? Keep it! Your $21 fee applies towards your purchase. Check out all of our Rocksbox reviews and our Rocksbox details to learn more. Ships to US. Looking for something a little different? Our editors also recommend the following women’s fashion boxes! Cost: Starts at $60 per quarter. Subscribe here! Coupon: Use code CMSA10 to save 10% off your first box. Why You’ll Love It: The Elizabeth & Clarke women’s clothing subscription is all about elevating and perfecting the plain, white shirt. Plain no more. They offer classic shirts (in a variety of colors) that are cute, polished, and sophisticated. Many of their garments also feature stain-proof fabrics and other innovative details. You’ll also love free and easy returns, with sizes from 00 to 18. Check out all of our Elizabeth & Clarke reviews and our Elizabeth & Clarke details to learn more. Ships free to US, and to Canada ($15) and internationally ($25). Cost: Starts at$39.95 per month. Subscribe here! Why You’ll Love It: Ellie is a workout wear + gear subscription! Each month you’ll receive a complete outfit, and if you opt for it, gear like small workout tools such as fitness bands or jump ropes, as well as accessories like water bottles and hip bags. Ellie reveals the outfits ahead of time, so you’ll get to choose your favorite each month. Check out all of our Ellie reviews and our Ellie details to learn more. Ships free to the continental US, and to AK and HI for $6.99. Cost: $35 per month. Subscribe here! Why You’ll Love It: Emma & Chloe is a jewelry subscription service that sends you a chic, well-made piece of French jewelry every month. They always feature a new, notable designer and offer everything from necklaces and bracelets to earrings and rings. You can select gold or silver-toned jewelry as your preference, and you can also let them know if you’d prefer clip-on earrings. Pieces have a retail value of up to $200 and come with travel pouches and a certificate of authenticity. Check out all of our Emma & Chloe reviews and our Emma & Chloe details to learn more. Ships to US and Canada. Cost: Starts at $89. Subscribe here! Coupon: Save 20% off your first order or first month of Unlimited. Why You’ll Love It: Flaunt designer fashion for a fraction of the cost with Rent the Runway! This high-end rental service features dresses, gowns, separates, jewelry, and accessories from designers like Tory Burch, Diane Von Furstenberg, Kate Spade, Oscar de la Renta, Badgley Mischka, and Christian Siriano. You’ll have a “chat” option for styling recommendations, but you pick out exactly what you receive. It’s great when you want designer fashion with flexibility. Check out all of our Rent the Runway reviews and our Rent the Runway details to learn more! Ships to US. That wraps up our list of the best women’s clothing subscriptions! Which ones fit best with your personal style?